Hunter had 72 tackles (51 solo),14.5 sacks and returned a fumble for a touchdown in 16 games during 2018. Analysis: Hunter set a career high in tackles and hasn't missed a game since his rookie season in 2014. The 24-year-old's sack total tied for fourth in the NFL, trailing only the likes of Aaron Donald, J.J. Watt and Chris Jones. The Vikings signed the 2015 third-round pick to a five-year, $72 million extension over the summer, and he rewarded them with the best season of his career. Hunter recorded five tackles (four solo) and two sacks in Sunday's 41-17 win over the Dolphins. 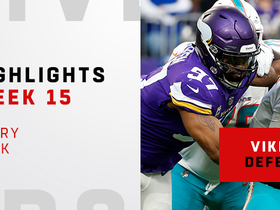 Analysis: The Vikings sacked Ryan Tannehill nine times on their way to a victory, and Hunter contributed two of them. The 24-year-old is now second in the NFL with 14.5 sacks, three of which have come in the last two games. Hunter had three tackles (two solo) and a sack in Monday's loss to the Seahawks. Analysis: Hunter last registered a sack when he exploded for 3.5 sacks Week 9 against the Lions and he's now tied for third in the league with 12.5. If the 24-year-old gets another sack this season, it will set a career high. 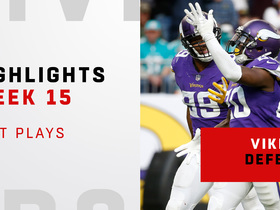 The Vikings will take on the Dolphins in Week 15. Hunter had 3.5 sacks, four QB hits, nine total tackles and returned a fumble for a touchdown in Sunday's win at Detroit. Analysis: Hunter leads the NFL with 11.5 sacks and is just one sack short of his career high (12.5 in 2016). 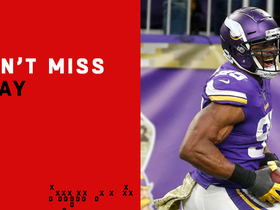 With Everson Griffen back to full strength (1.5 sacks Sunday), Hunter and Minnesota's pass rush look back to full gear for the second half of the season. Hunter recorded four tackles (one solo), including a sack, in Sunday's win over the Jets. Analysis: Hunter has recorded a sack or more in each of the Vikings' first seven games and is tied for the league lead in the category. He's already improved upon the seven sacks he registered in 2017 and appears on his way to a career year. Looking ahead, Hunter and the Vikings will face off against the Saints in Week 8. Hunter (groin) is not on Friday's injury report, Chris Tomasson of the St. Paul Pioneer Press reports. Analysis: Coach Mike Zimmer said that Hunter's lack of practice Thursday was "part of the plan," so it appears that the starting defensive end's Week 7 availability was never in question. Hunter will suit up against a Jets O-line which has struggled against the pass rush. Hunter (groin) was a non-participant in Thursday's practice. Analysis: Hunter was a surprise addition to Thursday's injury report, popping up with a groin injury of undisclosed severity. It remains to be seen whether the defensive end will suit up for Sunday's game against the Jets, but expect an update on Hunter's health if he is unable to return to practice as the week continues. Hunter recorded five tackles (three solo), including two sacks, in Sunday's win over Arizona. Analysis: Hunter recorded two sacks for the first time this season and is now up to seven on the year, tying his total for all of last season. He's tied for the NFL lead in sacks and has recorded at least one in all six games. He's proving to be one of the best defensive linemen in the NFL and a top IDP option. He'll aim to continue taking down the quarterback in Week 7 against the Jets. Hunter had two tackles and a sack in Sunday's 23-21 win over the Eagles. Analysis: Make that five games in a row with a sack for Hunter, who's been able to take down the quarterback in every game this season. He's well on his way to besting his sack total (7.5) from 2017 and has become as reliable as ever in IDP leagues. Hunter had six tackles, a sack and a tackle for a loss in Thursday's loss at the Rams. The sack was his fourth of the season. Analysis: Minnesota's defense struggled to generate much of a pass rush against the Rams, but Hunter can't be blamed, as he had three QB hurries according to Pro Football Focus. Hunter recorded five tackles (all solo), including a sack in Sunday's loss to Buffalo. Analysis: Hunter now has three sacks in as many weeks, and he's well on his way to meeting or exceeding his 7.0 sacks from a year ago. He'll look to maintain his strong, consistent play in Week 4 when the Vikings head to Los Angeles to take on the Rams. Hunter made five tackles (four solo), including a sack, in Sunday's tie with the Packers. Analysis: Hunter has now racked up 2.0 sacks in the first two weeks of the season, putting him well on his way to equaling or improving on the 7.0 sacks he posted in 2017. He'll have a chance to continue his string of strong performances against the struggling Bills in Week 3. Hunter recorded four tackles, including a sack, in Sunday's 24-16 win over the 49ers in Week 1. Analysis: Hunter signed a lucrative contract extension with the Vikings in the offseason and showed his worth early on in Sunday's tilt. He's wracked up 6.0 or more sacks in each of his first three seasons, and he's well on his way to another strong season in 2018. The quality of the Vikings defense overall gives Hunter plenty of one-on-one matchups and makes him a playable IDP in many formats. Hunter agreed Wednesday with the Vikings on a five-year, $72 million contract extension that includes $40 million guaranteed, Ian Rapoport of NFL Network reports. Hunter finished the 2017 with 47 combined tackles, seven sacks and one forced fumble. Analysis: Hunter saw a slight downtick in production following a tremendous 2016 season in which he recorded 12.5 sacks. 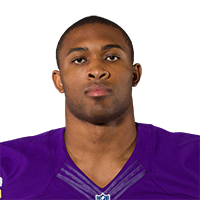 However, the talented defensive end was still a vital element of a Minnesota defense that ranked first in both total and scoring defense this season, and his presence opposite Everson Griffen makes the Vikings front four one of the most dominant in the NFL. Hunter is also only 23 years old, meaning he still has potential to grow as a pass-rusher. Hunter had three tackles (one solo) and one sack Sunday against the Bengals. Analysis: Hunter now has 38 tackles and seven sacks through 14 games, a regression from the 56 tackles and 12.5 sacks he posted in a full 2016 season. However, he should have a good chance to take down Packers QB Brett Hundley in Week 16, since he's being protected by an injury-riddled offensive line. Hunter had one solo tackle and one sack in Thursday's 30-23 win over the Lions. Analysis: Hunter now has a sack in each of his last three games, and four of his last five. However, the third-year pro only has 28 tackles (15 solo) through 11 games, making him lean heavily on a sack count that just started to gain some consistency. Against questionable offensive lines, though, Hunter is a solid IDP asset. Hunter recorded a sack for the second consecutive week in Sunday's victory over the Rams. Analysis: Hunter's sack total on the season is now up to five total. All in all, the 23-year-old recorded three tackles (one solo) on 37 snaps (63.0 percent snaps) to go along with his quarterback takedown. He will look to continue his sack streak on a short week Thursday versus the Lions. Hunter notched his fourth sack of the season in Sunday's victory over the Redskins. Analysis: Hunter added four solo tackles to go along with his sack. The 23-year-old almost had a second sack lead to a forced fumble and a touchdown, but the play was reversed upon review. 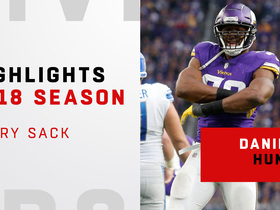 Watch every sack from Minnesota Vikings defensive end Danielle Hunter in the 2018 season. 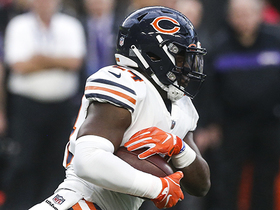 Chicago Bears running back Jordan Howard races away from the Vikings defense on a 42-yard run. 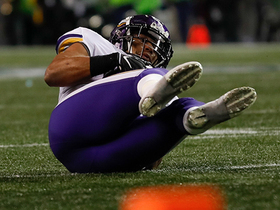 Minnesota Vikings linebacker Eric Kendricks intercepts a pass from Seattle Seahawks quarterback Russell Wilson. 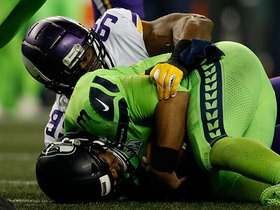 Minnesota Vikings defensive end Danielle Hunter sacks Seattle Seahawks quarterback Russell Wilson. 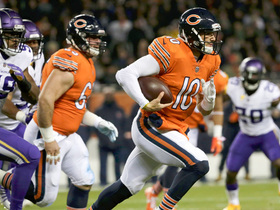 Chicago Bears quarterback Mitch Trubisky breaks away from a would be sack to pick up the first down. 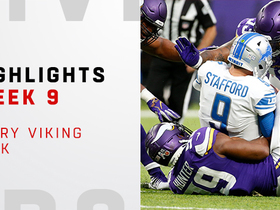 Minnesota Vikings defensive end Danielle Hunter scores a touchdown by recovering a Detroit Lions fumble for Week 9 of the 2018 season. 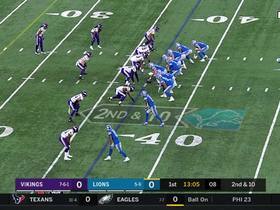 Watch highlights from the Detroit Lions vs. Minnesota Vikings game where the Minnesota Vikings defense had 10 sacks, a franchise record, against the Detroit Lions for Week 9 of the 2018 season.